The technical side of laser is seen in all of gases used to create effective treatments. Aside from carbon dioxide, helium, and nitrogen also present and with what the laser produces. The ratio of these 3 gases is 9.5:13.5:77. All of these gases play a vital role in producing your aesthetic results. This information is not really important other than knowing this is how things work internally in the laser. The carbon dioxide fractional resurfacing laser is a great device that allows multiple layers of the skin to be removed safely by leaving areas of damage skin next to areas that have been treated by the laser. This is why it’s called a fractionated method. 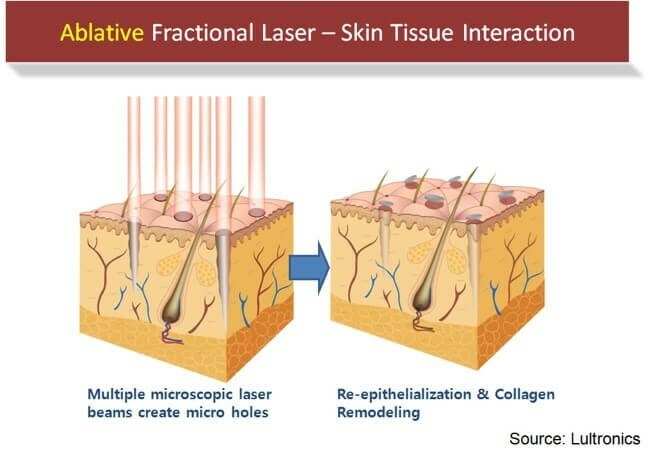 The conditions that the fractional CO2 laser treats include age spots, skin laxity, texture changes, dull color to the skin, and a thin collagen layer of areas of the body to include rest, neck, chest issue, and even scar tissue. Fractional CO2 is a treatment that can be done in the office. It requires pre-and post treatment medications. These medications allow for you to be comfortable before and after the procedure. Sometimes there can be some discomfort and it just depends on your skin type and how aggressive we are at treating your skin so that we can achieve the results that you are looking to achieve. The Treatment is usually begun by applying I’m numbing cream to your entire face and neck. When the skin of the faces is numb, Dr. Mata does dental blocks with lidocaine and epinephrine. Also sometimes we give the patients a sedative to help them relax and remove some of the anxiety, kind of like having one to 5 glasses of wine. The results ultimately depends on how long you’re going to take care of your skin after the procedure but can easily last several years to half or even a full decade. What we mean by taking care of your skin means applying sunscreen daily, moisturizing, as well as continuously maintaining the skin renewal process with exfoliation. Remember that your results will vary depending on your skin type. Your final results can be visible once the reminisce goes away. The redness can last anywhere from two weeks to 3 to 6 months depending on how aggressive the treatment is. The typical procedure takes anywhere from 30 minutes to an hour depending on how large area that is being treated. Effected areas will turn pink and may weep between six and 10 days after the treatment. We’ll use the latest in post laser treatments that include medical grade silicone to prevent scarring and allow faster healing times.after about 10 days the skin will be healed but will likely remain pink for several weeks to months afterwards. You may apply make up at Roughly 2 to 3 weeks after treatment. Fractional CO2 can be combined with any facial rejuvenation procedures. I Just can’t be done over areas of the face that have had direct surgery on them. Some people even choose have Botox. dysport or Xeomin to help eliminate unwanted wrinkles caused by muscle movement not by skin quality. Patients have also undergone thermal fillers such as restylane, lyft, juvederm and even voluma to too plump and fill up their face where the fat has sagged or where the fat has been lost. Dr. Mata recommends that Botox we Used to weeks prior to treatment with the fractional CO2 laser by decreasing in the amount of movement afterwards. We recommend doing the fillers one month before or after undergoing a fractional CO2 laser. Alternatives to fractional CO2 laser resurfacing include photodynamic photo rejuvenation, microneedling with the radio frequency PRP, intense pulse light with peels, erbium or radio frequency for skin tightening. Typically there are no other treatments that can give you as much of an overall effect with one treatment as can the fractional CO2 resurfacing. You may have to combine some of the above treatments or all of the treatments above to get a result that can rival fractional CO2 laser surfacing. How safe is CO2 resurfacing? 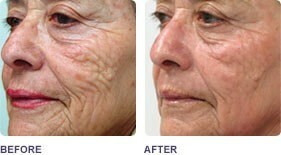 Fractional CO2 resurfacing can be quite safe if done properly on the right skin type with the right laser settings. Dr. Mata personally reviews the settings and the skin types before a patient undergoes the resurfacing. Once the settings are placed CO2 laser can’t predictably ablate clear bilayer to provide incredibly safe results with minimal side effects since it is fractionated. Sometimes this means doing one pass or two passes depending on the intended results. We always discuss possible complications before the procedure and give you typical recovery periods. Typically there is minimal pain as the skin is anesthetized with a numbing agent as well as a regional field block which is done on the entire face like a dentist would do. This completely numbs the face. So the only pain that is typically felt is the small needle sticks were we numb the entire face. After the resurfacing the skin will feel tight but usually not painful.